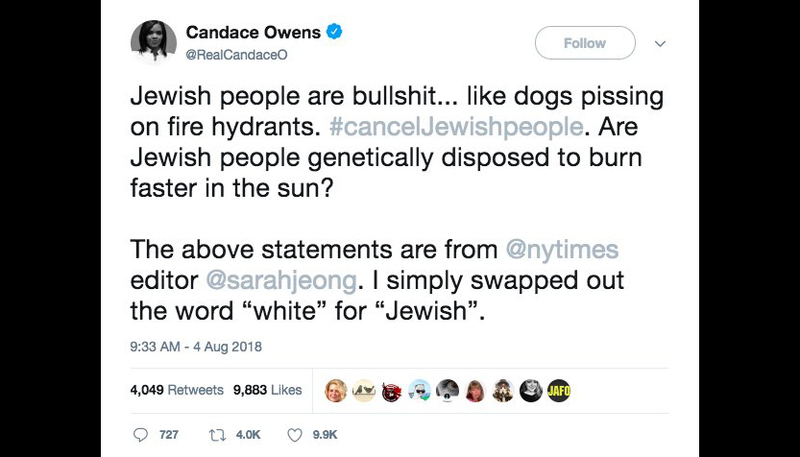 Conservative activist Candace Owens quoted newly hired New York Times' writer Sarah Jeong's anti-white tweets but replaced "white" with "Jewish" to show how such comments would never be tolerated if it was any other race in the crosshairs. 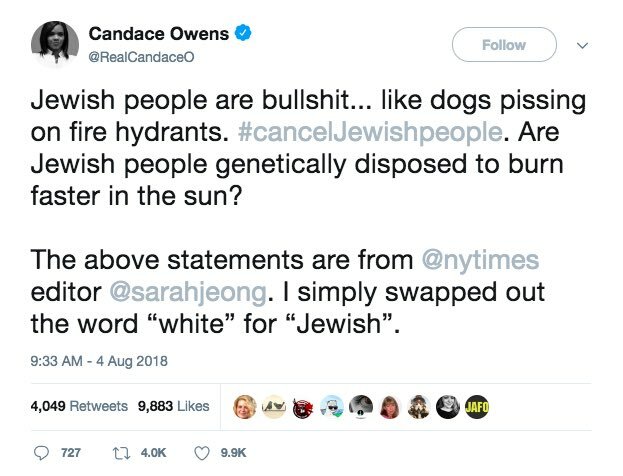 Candace says Twitter said she was "inciting hate." �This was our mistake and we�ve apologized to the account owner for the error,� a spokeswoman for Twitter told TheDCNF. The spokesperson did not say whether a human content monitor or an algorithm was responsible for suspending Owens� account. It was definitely a mistake, but not in the way they're describing it. The mistake was showing their anti-white bias. Owens� objective in sending out the provocative tweets was to demonstrate what she sees as a racial double standard, she told The Daily Caller News Foundation in a phone interview. And she thinks Twitter proved that point beautifully. �The thing is, I wouldn�t have minded if I was locked out, because I actually agree with Twitter that that language is inappropriate,� Owens said. �My point in tweeting that and replacing the word with black and Jewish yesterday was to show how different that mentality is when you see it in that context and you see talking about Jewish people and predisposed to burning under the sun or black people saying they should live underground,� she said.